What’s fun, cheap, good looking, and cleans a hardwood floor with an advanced search and navigation algorithm? 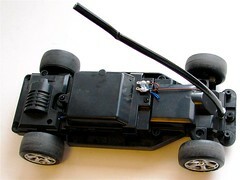 An electrostatic dust mop attached to a radio-controlled car. Vroom! This combination has some things in common with a Roomba, but is arguably less expensive. It’s quick and fun to build, and quick and fun to operate. The second major component is the business end of an electrostatic dust mop, such as a Swiffer, or the equivalent model from 3M that we’re using here. Construction is pretty straightforward: Figure out a way to attach the dust mop to the car! Let’s get started by taking the body off of the car. Thankfully, everything is held together by screws. After removing the body, take a look at the front end of the chassis (the right side in the photos) and try to find a place where we can begin to attach a mount to the dust mop end. It turns out that there’s a neat little ledge– with a screw hole even– right by the front bumper. So, we’ll build a little plank to hold the dust mop that attaches to that screw hole. I built the mop-support plank from a blank printed circuit board. (You can use a piece of metal or plastic for this, but I happen to have these lying around!) 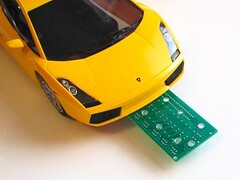 Blank PCBs are a good construction material because they are (1) cheap, (2) very strong and light fiberglass-epoxy composite, (3) flame retardant, (4) easy to cut to shape, (5) often supplied with holes in them, and (6) ready to be soldered. Later, once you’ve tested the working RC dust mop and are sure that the plank is in the correct location, you can add additional screws and/or superglue to hold it in place more securely. Put the body of the car back on the chassis, and attach the mop end. I used a pair of cable ties to attach the short mop handle to the circuit-board plank. To adjust the height, I put in a little balsa wood spacer beneath the mop handle. Okay, so let’s try it out! As you can see in the video, it’s very fast, but the steering is awkward. Fixing that is a matter of adjusting the position of the mop face so that it drags on the ground a little more evenly. And does it work, i.e., does it clean up the dust on the floor? Hell yeah! Here is the Dust collection apparatus with some of the dust that it’s collected, shown with one of the common varieties of artificial artificial intelligence control system that we use to control the RC car. This particular variety of control system has considerably more processing power and memory than most presently-available microcontrollers, and is somewhat easier to program. This entry was posted in EMSL Projects and tagged diy, hacks. Bookmark the Permalink. But oh, the operating costs for those AAIs! You can save some money by running one of these on NiMH’s. In the time it’d take to steer the car back and forth I could have swept the floor myself! I want something that saves time, not wastes it. 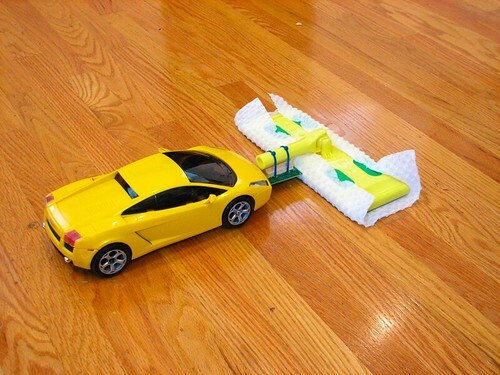 Who wants to take 30 minutes to swiffer a floor with a R/C car when you can do it manually in 3 minutes? Now a R/C lawnmower, that would be something! Or even better, R/C Snow Blower! What fun would that be! Sitting inside, nice and warm, watching it clear your driveway! First of all, this is a 5 minute project, not a 30 minute project. And yes, it’s faster for me to sweep the floor than for me to build that. used— whether it’s pushing the dust mop manually or with the car. cheerfully. THAT makes my life better. It might work a little better on turns and in corners if there was some way to hook up to the back of the vehicle. The arc of turns would be much tighter (of the mop end). Think of a forklift truck where the steering is to the rear. It might help with the problems of adjustment in turns. In long travels it would be less strain on everything by pulling. You can hang alot of weight from a string but it takes a much stronger object to hold up the same weight. Pulling is much more efficient than pushing. That’s true, and it’s a very good point. power the vacuum, or you could directly use a dustbuster. Growing up, we had one of those early programmable robot vehicles that I totally didn’t appreciate at the time. 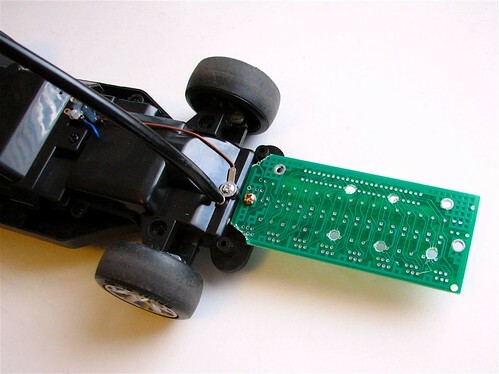 6 wheels, independent suspension, 4WD, keypad on top … basically all you could do was tell it to travel X many vehicle lengths, turn Y many degrees, and so forth … plus flash a little LED intended as a fake laser beam, complete with sound effects. (It’s cooler when you recognize how little robot toys have progressed in 20 years!) I’m just thinking that an updated version would be the ideal platform for one of these. Of course, you’d still have to program it manually. Bah, humbug. That was a Big Trak. I had one too. entry for it; it looks pretty sweet! What size is the car? 1/10? 1/16? etc. It’s a 1/16 scale, about 11" long. 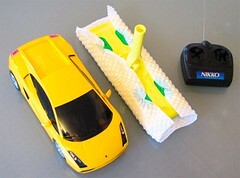 Cool idea but a nitro R/C would make that so much more fun! My son already invented this type of device though not exactly the same. 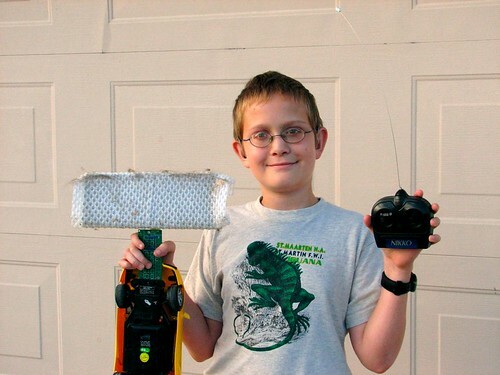 He did it for a school "invention convention" in 5th or 6th grade. 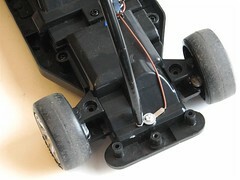 He attached a small dustbuster to the chassis and tilted it so that it picked up debris. Yes this was before Roomba hit the market. well how do u make it? how about u put a vacuum cleaner to it to make a rc Roomba? That is a very cool way to make work fun, I can’t help but wonder what’s next? I have often thought about converting a Traxxas RC Truck into a lawn mower, but it seems like it would simply be too expensive and difficult to use. Anyone have any other cool RC conversions to help you get work done? There are RC forklifts. Maybe attaching the swifter to that would work wonders plus there could be many other uses for the forklift. Just google RC forklifts to see what they look like. watch them there built using modded rc trucks but i didnt build them someone else did. i did a mod to a 1/10 new bright rc dodge police car where i made a pepper spray cannon and cut a hole into the top. i made the pepperspray cannon to go up down spin left and right. the car’s remote got hacked by adding a seperate control panel onto it. the cannon was adjusted so it’s radio waves can be recieved at the max distance of the car. same thing with the cannon controls. I made the cannon so it can go at an angle that it can spray a person’s eye. the spray comes out very powerfully so thats how it can be so low and hit a persons eye. i gave the instructions to the local police and then they all went to toysrus and home depot and various places and came back with like 50 of each material needed. cool.